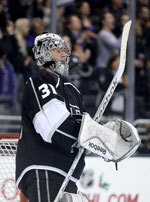 LOS ANGELES – The Los Angeles Kings have acquired a third-round selection in the 2014 NHL Draft from the Edmonton Oilers in exchange for goaltender Ben Scrivens. The Kings have also recalled goaltender Martin Jones from the American Hockey League’s Manchester Monarchs, Kings President/General Manager Dean Lombardi announced today. Jones, 24, has appeared in 11 games with the Kings this season (his first in the NHL), recording an 8-3-0 record with a 1.41 GAA, .950 save percentage and three shutouts. Jones, who was the NHL Co-Rookie of the Month for December, who his first eight NHL games, tying an NHL record (Bob Froese also won his first eight games with Philadelphia in 1982-83). The 6-4, 187-pound native of North Vancouver, British Columbia has also appeared in 15 games for the Monarchs this season, recording an 11-2-2 record with a 2.08 GAA, .933 save percentage and one shutout. Scrivens, 27, appeared in 19 games with the Kings this season, recording a 7-5-4 record with a 1.97 goals-against average, .931 save percentage and three shutouts. The 6-2, 193-pound native of Spruce Grove, Alberta was acquired by the Kings (along with Matt Frattin and a second-round draft pick) in a trade with Toronto (for Jonathan Bernier) on June 23, 2013. The Kings begin a five-game road trip tomorrow in St. Louis, with game time from the Scottrade Center slated for 5 p.m. (PT). The game will be broadcast on NBCSN and KEIB AM 1150.